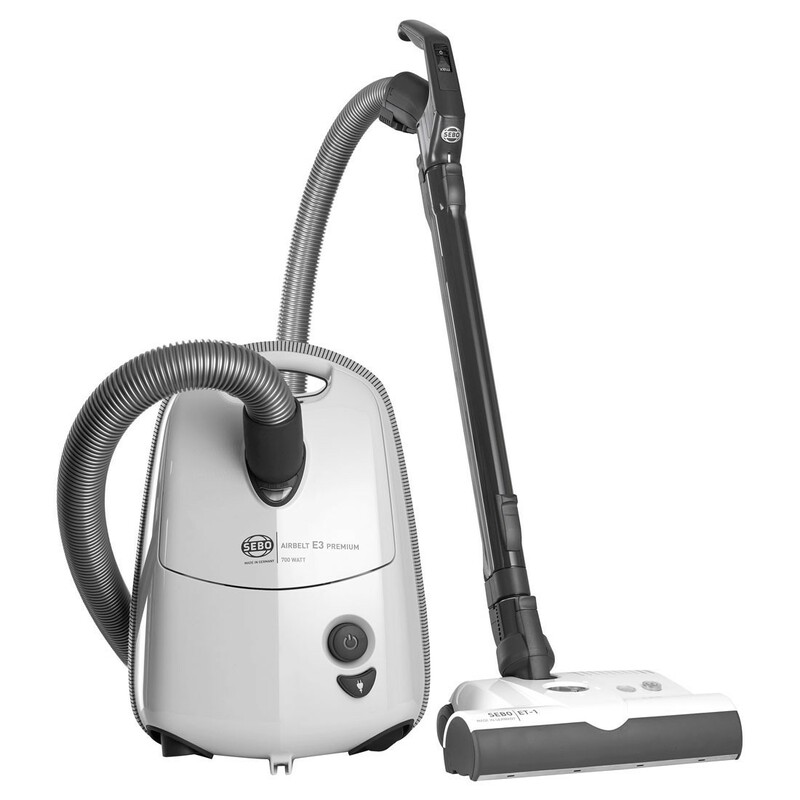 The Sebo Airbelt E3 Premium ePower Vacuum Cleaner is the ultimate cleaning machine. Compact and lightweight it is also highly functional with an iconic modern design and low noise level. The suction power of the energy-saving 890W motor is boosted by a high-tech tapered hose. The E3 Premium with the Sebo ET-1 power head lifts carpet pile and removes even difficult pet hair giving exceptional cleaning, effortlessly. Featuring a suction boosting tapered hose and a lightweight telescopic tube that can easily be adjusted to a comfortable length to make vacuuming easier. The innovative Airbelt soft bumper system protects your walls and furniture from marking, whilst the easy-glide castors let the machine move with the lightest pull and ride over thresholds with ease. The full size upholstery and crevice nozzles are conveniently located in the machine and are always at hand. To protect the motor Sebo have developed the Intelligent Motor Protection system which turns the motor power down when there is a problem such as a blockage. This means you can still use the machine and the blue on light turns red to notify you that the Intelligent Motor Protection system is active. The E3 Premium is suitable for carpet and hard floor and comes with the Sebo Kombi professional cleaning head and the Sebo ET-1 electric power head.